MLP:Rise of Vicis has released a video update featuring Rainbow Dash. I have to say, while it looks fairly promising, it looks like the team could really use a graphics designer. Also, I still think that it's too early to show off yet (even if they do need team members), and they should wait until they're a bit further along then they are right now. Equestria Gaming now has a Google+ Page! Well, we've recently decided to get a Google+ page, that you can find at https://plus.google.com/b/104923021330270502188/104923021330270502188. It's not THAT big of a deal, but just decided I'd post anyways in case any of you guys were interested. Hey there readers of Equestria Gaming! Strawberry Spice here, and I've got an important announcement for everyone. I'm going to be stepping down as the head of Equestria Gaming, and I'm handing the position over to the wonderful XTUX345. Usually, when an amazing pony-related video game project that knocks everybody's socks off is revealed (finished or not), we are among the first to know about it. However, at times they manage to slip under everybody's radar, and when we finally notice it, we feel immensely embarrassed for not paying any attention to it, or not even knowing of it's existence. This is one of those times. While various MLP:FiM kart racing games have popped up (none of which are yet released), Ponykart is the most well-polished karting game we've ever seen, and I have high hopes for it. For more information on Ponykart, check after the break! At Equestria Gaming we get to see many different types of pony-related indie games that are under development. Massively multiplayer online games, platformers, adventure games, and a complete overload of RPGS. Ironically, up to this point in an industry saturated in first person shooters we have not seen a single first person shooter under development, and no, I don't count mods. However, today that all has changed. 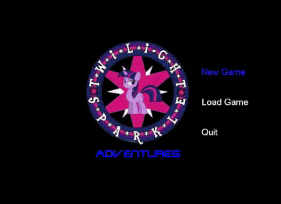 A My Little Pony FPS (while still in early development) has arose. Find out more information after the break. EverFree Radio has been releasing some HD footage from various panels at BroNYCon. As many of you know, three of the members of Mane6 (the dev-team behind My Little Pony: Fighting is Magic) were there with their own panel to demo the current running version of the game. This is the footage of that panel. Prominence (programmer), Nappy (programmer and animator), and Leedin (animator) were all present to play some rounds of this pre-alpha version of the most anticipated pony game on the horizon. In this video, we see two new characters beyond the original Applejack and Twilight Sparkle; Pinkie Pie and Rarity. Although those two are still early in development, they are very playable. Also in this demo is a new stage with new music: Carousel Boutique. This video is definitely worth a watch if you're interested in the progress of this game and the people behind it. I, for one, will be playing this an unhealthy amount when it gets released. Hopefully you all had a relaxing and rewarding blackout day. For those of you who missed it, Equestria Gaming blacked out, along with countless other websites in protest of H.R. 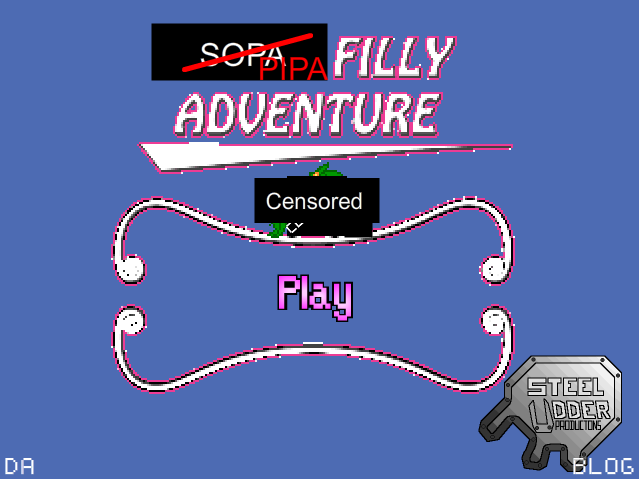 3261 and S. 968 (SOPA and PIPA: you all know what they are, no need to explain). We believed it to be a necessary gesture in the fight against these bills, which would effectively destroy the internet we know and love. Another MLP:FiM game in early development has recently popped up, and for once it isn't an RPG! From what I've seen so far, it appears to be a platformer in a very early state, and in need of a couple team members too. As a matter of fact, if I were the developers I wouldn't show it off in it's current state, but it's their game, and they can do what they want with it. The developers also accept suggestions, and you can give them feedback and helpful, constructive criticism at http://mlpriseofvicis.webs.com/gotideas.htm. Anyways, check out a video preview and a couple of screenshots after the break. Equestria Tales: Elements of Chaos is a cel-shaded RPG/platformer game in development by Byrpheros. Equestria Gaming posted about this a while back, but now, an actual video has surfaced of gameplay in its early stages. So far, it looks very cool. You can follow the development of the game over on their website. A couple weeks ago I reviewed the Pony Platforming Project, a work in progress 2D platformer created by Mark Sprague. In my review I stated that while it was a good game and showed lots of promise, it had quite a few issues holding it back, and with the developer having recently joined Mane 6 I believed that this excellent game would be abandoned, and stay in it's unfinished state forever. Today, I have been proved wrong, as Mark has released a new, Christmas-themed version of the Pony Platforming Project. Does it manage to overcome the problems that plagued it's predecessor, or does it crash and burn? Find out after the break. 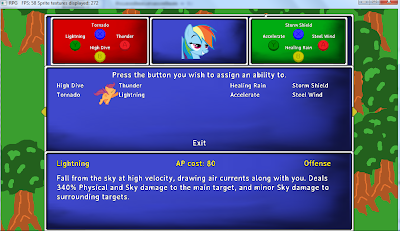 Yet another pony RPG - "MLP Between Dusk and Dawn" is in the works, and its creator, Kaijyuu, has decided to release this demo to show off the custom game engine and generate some interest for the game. All the animations are placeholders and the game in general is in a very early state, but even so, this demo is spectacular in nearly all facets. This is already a very fun and well made game, in my opinion, but it's going to get much much better. The creator, a brilliant programmer, needs some assistance with spriting, background art, sound, etc. The stuff in the game now is mainly placeholder, but with the help of some skilled bronies, I'm sure will look amazing. You can find out more about how to help at the Forum Thread, and or the Ponychan Thread. Read more about the demo itself after the break! Well, the domain transfer was 100% successful! The site will continue as it has been. If you're curious why I changed, read after the break. 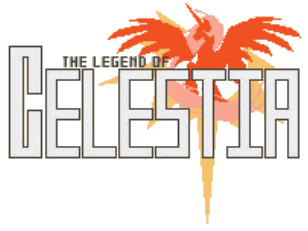 The Legend of Celestia Team is Seeking a Pixel Artist! Ok, so apparently the team behind "The Legend of Celestia" has lost their sprite artist, and they're looking for a new one. The development team Equestrian Dreamers has been hard at work creating their flagship game - My Little Investigations. This crime-solving game takes inspiration from the Ace Attourney series. My Little Investigations follows Twilight Sparkle, who plays the role of an investigator in Equestria. The game will include crime-scene investigations, numerous interrogations, and the final confrontation to catch the culprit. This game is far from completion, but so far, it looks absolutely brilliant! The content that they have for us is a series of engine demonstrations, representing different facets of gameplay. There are 5 videos in total, with around 50 minutes of content. You can watch the remaining 4 videos after the break!